Beer culture in Bavaria is one of the most deeply embedded and richly woven in the world. It is the region of the world that helped create and define the lagers that would on to dominate the planet's drinking habits, home to the longest continually operating brewery in the world, the heartland of hefeweizen and also where many of the classic hop varieties have been grown for centuries. It's also where Annabel Meagher, co-founder of Melbourne brewery Himmel Hünd, travelled last year after she won a scholarship from the Pink Boots Society (PBS), a global not-for-profit organisation that aims to empower and educate women working in the beer industry through training, scholarship opportunities and networking. It was started in America ten years ago by Teri Fahrendorf and the membership base has been growing over the world ever since. 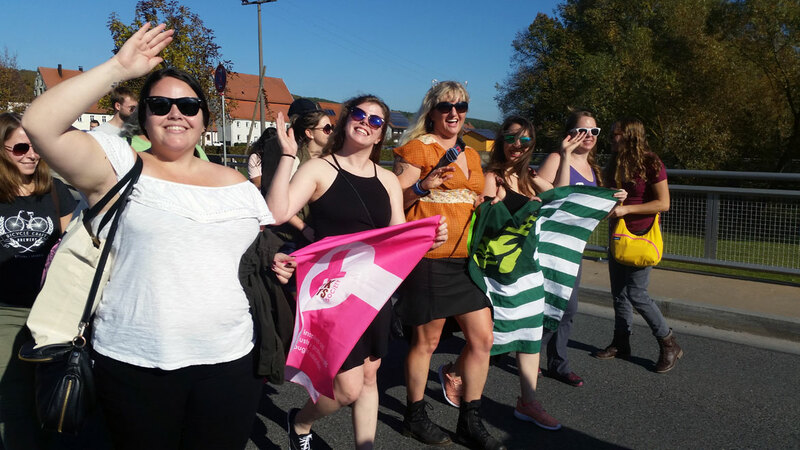 "One of the initiatives they started a few years ago was to send a group of women to Germany on study tours to visit breweries, hop farms and more," says Annabel, who applied for a place after seeing it advertised on the Pink Boots Society website. "The application involved filling out a questionnaire about my experiences, skills and reasons for applying. It was a complete surprise when I received an email to inform me I was successful! I feel really honoured to have been chosen to take part in such a wonderful once in a lifetime experience." Part of the PBS mission is to have members "pay it forward" when they receive scholarships by sharing knowledge they've acquired. In Annabel's case, she was good enough to approach The Crafty Pint to ask if we could help her do just that and we thought that was a damn fine idea. Why did you choose to head to Bavaria? Annabel at Faust (left) and in "wheat beer heaven" at Schneider Weisse (right); a glass of beloved Augustiner Helles in Munich (centre). I don’t think it’s a secret that I love Germany – my brewery is called Himmel Hünd, meaning “Sky Dog” in German, and we brew mostly German and Belgian style beers – and the place I love most in Germany is Bavaria. I spent time there as a high school exchange student, university student and later worked there as an engineer. I just find the whole place magical with its beautiful countryside and forests, old cities and castles, amazing food and beer festivals and appreciation of the environment and lifestyle that most Bavarians have. So, naturally, when I saw an opportunity to head back there and immerse myself in the beer culture, I jumped at the chance! The tour itinerary read like a dream come true for me. How did you decide where to visit while there? The tour was pre-organised by Up Close Tours in collaboration with Pink Boots Society and, my goodness, did they do a brilliant job! There was a strong focus on breweries owned by women or that employ female brewers and the majority of breweries were smaller, independent ones that were dabbling into the world of craft brewing and branching out from the traditional beer staples found in every Bavarian brewery like Hefeweizen, Bock, Dunkel and German Pilsner. I basically expected to drink a lot of wheat beer and maybe go on one very formal brewery tour a day, particularly through some of the bigger, more internationally well known Bavarian breweries. I also expected the brewery tours to be quite formal and had no idea that we would be obtaining VIP access to some of the most amazing cellars, ancient Benedictine breweries and be special guests at a hop festival (pictured above)! My expectations were already surpassed after day one. It has been a long time between visits to Germany and I forgot just how high the standard of beer quality is in Bavaria. I didn’t drink one single bad or even average beer and I drank a lot of beers during the tour! 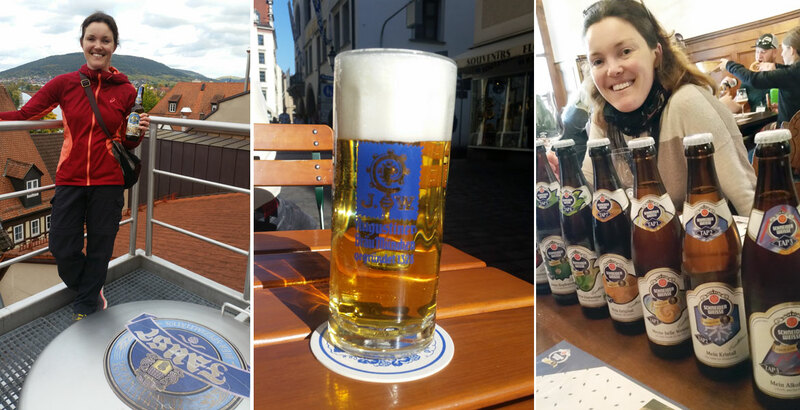 Despite having studied and worked in Germany, I hadn’t yet delved so deeply into all of the small town beer culture of Bavaria so there was plenty to discover. I was pleasantly surprised to discover that most small towns and regions only served locally brewed beers to support the neighbouring breweries and to ensure only the freshest beer was poured on tap. The first stop was in a beautiful old town called Miltenberg (pictured below). After walking around the town upon arrival, I soon discovered that the only beer available at all of the restaurants, cafes and bars are those brewed the local family run Faust Brauerei; not one other brand of beer to be found. Normally, I would be disappointed by lack of choices at a Melbourne bar, but this beer was so fresh and expertly crafted and the brewery had such a fantastic range of styles that it didn’t matter at all. What sort of beers are craft brewers making there? The beers that are coming out of Bavarian craft breweries are so interesting because they are still mostly bound by the Reinheitsgebot to only use water, malt, hops and yeast in their beers, otherwise it cannot be classified as a beer. Some brewers go so far as to travel over the border to Salzburg to brew at a friend’s brewery and import something like an oyster stout labelled as beer! Andy Gänstaller from the relatively new Gänstaller Brau in Hallerndorf started out as a homebrewer. He and his brewer daughter have spent a lot of time in the USA, where he fell in love with big hoppy IPAs. Their range of beers is best described as strong German beers packed with a punch in the face of hops! The crafty nature of his beers comes through in the tongue-in-cheek names, with beers such as “The Weizenator Weizenbock”, “Affumicator Smoked Doppelbock” and “Schwarze 90 Imperial Stout”. I was lucky enough to taste the latter straight out of the Bright Beer Tank and it was a velvety, chocolaty, slightly smoky and aromatic delight with Gänstaller’s signature roasted, bitter finish. Giesinger Brewery in Munich has a phenomenal range of craft beers alongside all of the traditional Bavarian staples. Their Lemondrop Triple has a unique lightness to the mouthfeel and finish compared to a traditional Belgian Tripel due to the absence of liquid candy sugar and the use of Lemondrop hops in the fermenter that add a really powerful fresh, citrus dimension to the aroma. It was astoundingly refreshing for a 7.5 percent ABV beer. As Head Technical Brewer Simon Rossman pointed out to us, there are literally hundreds of combinations of different types of malt, hops and yeast available to brewers with more being developed. 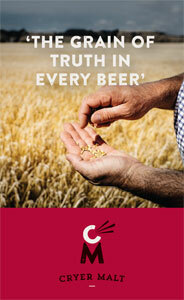 Giesinger is certainly at the forefront of craft beer innovation using traditional raw materials and methods. 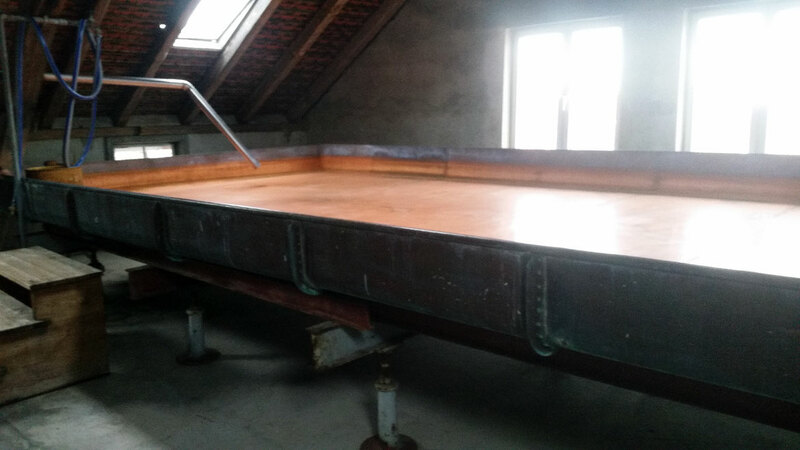 Just down the road in Augsburg, highly successful family owned brewery Riegele are experimenting with new ingredients, barrel ageing and more modern methods and styles. Each year, the owner heads to America to brew a collaboration brew with a different US brewery. Our welcome beer at the brewery was “Bayerisch Ale 2”, a citrusy, hoppy beer using two types of malt that was brewed in conjunction with Sierra Nevada in 2017. As Riegele have their own brewery bar, they take advantage of this by brewing some experimental non-purity law conforming beers on their pilot system. Newly apprenticed brewer Teresa was brewing a coconut and cacao porter and a cucumber pilsner when our group visited. Urban Chestnut 2, in Wolnzach, is a small brewery located in the Hallertau region. The owner is an expat German living in America and he originally opened Urban Chestnut 1 in St Louis before opening a second location back in his hometown. 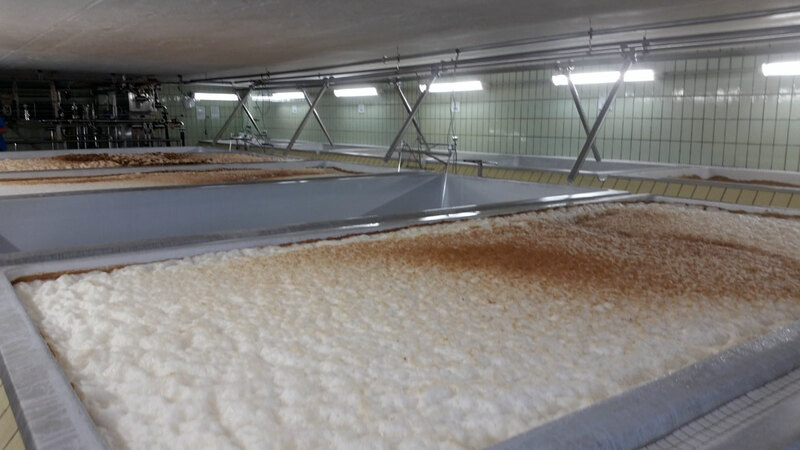 Open fermenters – compulsory in every German ale brewery. Do craft beer and traditional Bavarian beer cultures coexist happily? Most of the craft breweries in Bavaria brew both a traditional range and a specialty or craft range. The craft brewers certainly have a great respect for the traditional styles and methods, however many smaller craft brewery owners find it difficult to break the market in their small towns due to the power of the market giants that supply the majority of the beer drinking market. As you drive through the area, the beer garden landscape is full of umbrellas, tables and staff bedecked in the logos of the Bavarian brewing giants. Many of the large breweries sell their beer at a fraction of the price that it costs to make beer in a smaller brewery and the craft brewers simply can’t compete. However, craft beer is rising in popularity, particularly amongst young people and the craft breweries are becoming more innovative in their approach to selling their products. Almost all of the successful craft breweries have their own onsite bottleshop, bar and restaurant, function room and merchandise shop and make most of their profits from direct sales. Visiting Sister Doris Engelhard (see photo at top of article), the last remaining nun brewer in Germany, at Mallersdorf Abbey Brewery was an absolute joy. This 67-year-old Benedictine nun and Bavarian Brewmaster has a wicked sense of humour, navigates an iPhone better than I ever could and brews an impressive lager. 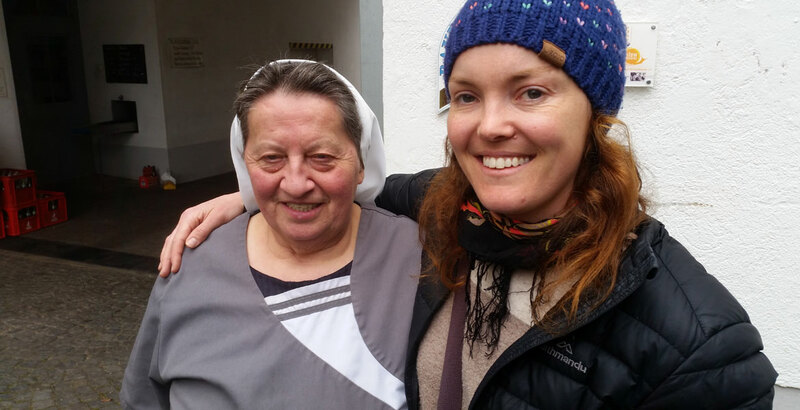 I was lucky enough to have a conversation with Sister Doris in German and she even invited me to come back and take over the brewery when she retires… The only catch is that I would have to become a nun! 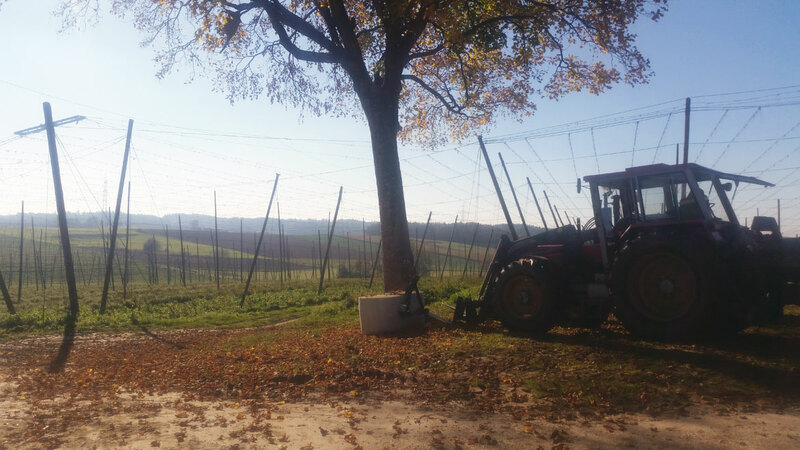 Another highlight was visiting a hop farm in the famed Hallertau region. Here we were welcomed by Hopmeister Stefan Stanglmair, whose family has been running their hop farm (pictured above) for hundreds of years. We were privileged to walk through the hop fields and had an in depth tour of the drying and packing process. Stefan and his father work day and night throughout the entire harvesting season to manually run the old fashioned kiln in the Oasthouse. After our tour, we indulged in unparalleled hospitality and a delicious meal made by Stefan’s mother of 100 percent locally grown sustainable food matched with beers containing Stanglmair hops, including Aventinus Eisbock, to end a magical evening. Are there any lessons you'll bring back to Australia and Himmel Hünd? Any tips for Aussies heading to that part of the world? The traditional October Spalt festival in the town of Spalt is not to be missed. Each year after hop harvest, the local brewery makes a beer with the fresh hops and kegs of the beer are then delivered all through the town on horse and cart by the annual Hop Queen. There is a parade following the cart and each venue offers schnapps to the parade goers after their kegs are delivered. There are bands playing and beer flowing whilst the local fire brigade raise a tree that has been chopped down in the forest early that morning. Then, in the evening, the town brewery (and I mean literally TOWN brewery – if you own a house in Spalt, you automatically own a share in the Spalter Brewery. How cool is that?!) hosts an evening of music, dancing and, of course, beer drinking until the early hours of the next day. Drink a Helles vom Holzfass (lager from wooden tap) at Augustiner am Platzl in Munich! A colleague of mine made this same recommendation to go to this cosy pub for the Munich specialty and it was sensational. Afterwards, I recommend heading to the Englischer Garten with a few takeaway craft beers from Die Bierothek (The Beer Library) or Biervana - drinking in public places is allowed all over Germany – and watch the “surfers” ride the Eisbach river wave. It’s like nothing else you’ve seen before! The historical town of Bamberg is a must visit for any beer aficionado. Aside from being a beautiful old city with cobblestoned streets and Romanesque architecture it is also home to a plethora breweries, with more than ten breweries within walking distance in the centre of the city alone. It’s no secret that Bamberg is famous for Rauchbier and even if smoke beer isn’t your usual first, second or even third choice of beer at the pub, the quality and balance of beers from the likes of Schlenkerla, Fässla and Brauerei Spezial are so first rate that this once upon a time non-believer is now a big fan of a good Rauchbier. Beer and food lovers absolutely have to try the Bamberger onion with a Märzen (smoked of course) at the Schlenklera Brewery pub. 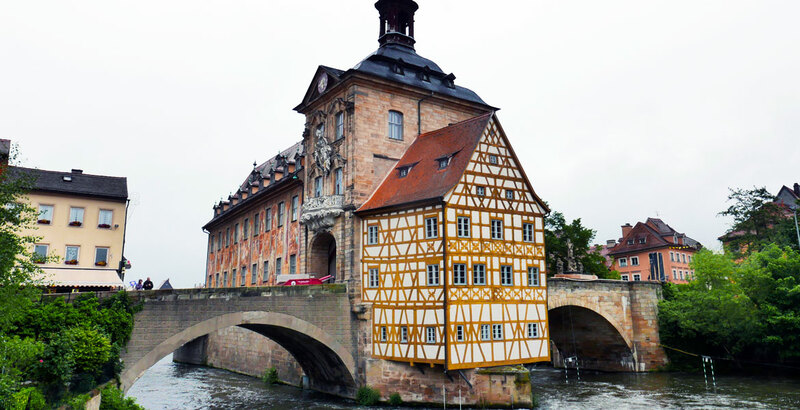 Historic Bamberg. Photo by Nic Sandery, whose article on his travels there can be read here. This brewery is run by two sisters who have started a movement to get more Bavarian women to drink beer. Must try: The Weizenbock with the “sting” (a red hot poker placed into the beer to caramelise the sugars and warm the foam). This impressive compound containing a brewery is run by Benedictine monks, along with their own bakery, butchery, hop farm, forest for wood chips to power the brewery steam generator, bee hives, vegetable garden, school, library, small distillery and more. Must try: The beer schnapps made entirely from distilling a Doppelbock. You could blink and miss Faust Brewery if you weren’t concentrating. On the outside it looks just like another house next in a medieval cobblestoned street of Miltenberg. Once inside, the tour takes you up and up from the underground cellar to the top of the fermenters, walking upstairs through seemingly neverending levels to see the different brewing processes in action. German brewers certainly know how to fit their breweries into a limited space! Must try: The Brewer’s Reserve is a really special beer that uses red wine yeast in addition to brewer’s yeast and is aged in whisky barrels. This trip was an experience that I will never forget and I would like to thank the Pink Boots Society immensely for all of the hard work they do to find sponsors for scholarships like this and Tom Conrad from Up Close Tours for organising such a fantastic tour. Everything I’ve learnt has been invaluable to my career in the brewing industry. 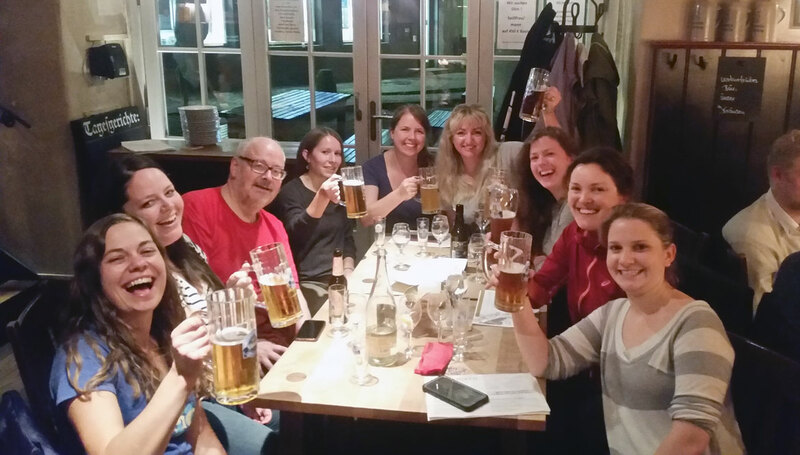 The Pink Boots Society annual Bavaria Immersion trip is open to any beer enthusiasts who want to take part on an adventure of a lifetime. The scholarships are only available to Pink Boots Society members. Keep tabs with the activities of the Australian PBS here. You can read about what's happening at Himmel Hünd's brewery in Brunswick here and, for more Beer Travel pieces on this site, head here.